As executive producer on the television series Supernatural, McG has some experience working in the horror genre, but he had never directed a horror feature until the Netflix movie The Babysitter, a film which also has a strong current of comedy running through it. Judah Lewis does a great job in the lead role of Cole Johnson, a 12-year-old who has a major crush on the titular babysitter, Bee (Samara Weaving). When you see them interact, it's easy to understand why, as their personalities mesh perfectly: they dance to Foghat, talk about Star Trek and Alien, and have memorized dialogue from Billy Jack so they can act out the movie along with the actors on the screen. Trouble enters paradise when Cole stays up late one night to see what Bee really does after he's asleep. He never could have imagined that she and her friends (played by Bella Thorne, Robbie Amell, Hana Mae Lee, and Andrew Bachelor) are a Satanic cult who perform human sacrifices in his house and use his blood in their rituals. It's a young kid's most outlandish nightmare come true. Once Cole has discovered the Satanists in his living room, The Babysitter becomes a blood-drenched variation on Home Alone, as Cole does whatever it takes to survive the night - and the killers keep managing to get themselves killed. The deaths in this film are often grotesque and usually amusing. While all of this death and insanity is going on, the neighbors around Cole somehow manage to remain completely oblivious. 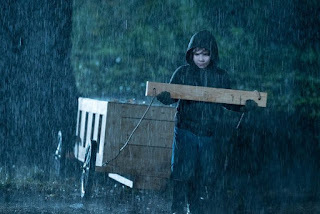 The only one who has even the slightest idea of what's happening is Cole's more age appropriate love interest, a young girl named Melanie who lives down the road and is played by Emily Alyn Lind of the Duffer brothers' film Hidden. Scripted by Brian Duffield, The Babysitter is a really fun movie that isn't quite set within our reality. Things are a little off, and a bit heightened. While the story is small in scale, McG directs the hell out of it, splashing stylistic flourishes all over. His choices may be too madcap for some viewers, I know McG has gone too far for my taste in the past, but here I found the director's choices played well and enhanced the film's quirky charm. Funny but twisted, pleasant but bloody, The Babysitter is highly entertaining. When writer/director Zak Hilditch's Stephen King adaptation 1922 came on Netflix, I really had no idea what to expect from it. Although I'm a fan of King, I have never read the novella this film is based on, and only had a vague idea of what sort of disturbing story it would be telling - the story of a man who convinces his son to help him murder the boy's mother. 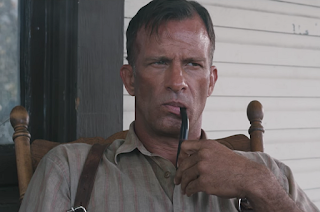 The way Hilditch brings that story to the screen turned out to be captivating, and while it could have been intriguing with a different actor in the lead role, 1922's greatest asset is the fact that it stars Thomas Jane as Nebraska farmer Wilf James, and this is Jane as you've never seen him before. Jane completely inhabits this character, even giving him a very unique way of speaking. He disappears into the role, and my Remake Comparison co-writer Priscilla, who I watched the movie with, was amazed by the transformation. Wilf's wife Arlette (Molly Parker) isn't happy on the farm and plans to sell off most of the land they have so she can move off to the city of Omaha. And she intends to take their teenage son Henry (Dylan Schmid) with her. Wilf doesn't want to lose the land or his boy, so he begins plotting his wife's murder... and does indeed find a way to rope Henry into participating in the crime. Wilf thought killing Arlette would be a good move for his own life, but instead his world starts to crumble once he dumps his wife's body into an old, rat-infested well behind the house. He pays for what he has done in some very unexpected ways, and his comeuppance comes little by little. I really can't say enough about what Jane does as Wilf. Hilditch did a great job writing and directing the film, and Jane proceeds to take that foundation and elevate the material to an award-worthy level. He really makes 1922 something special; it's an absolute must-see. 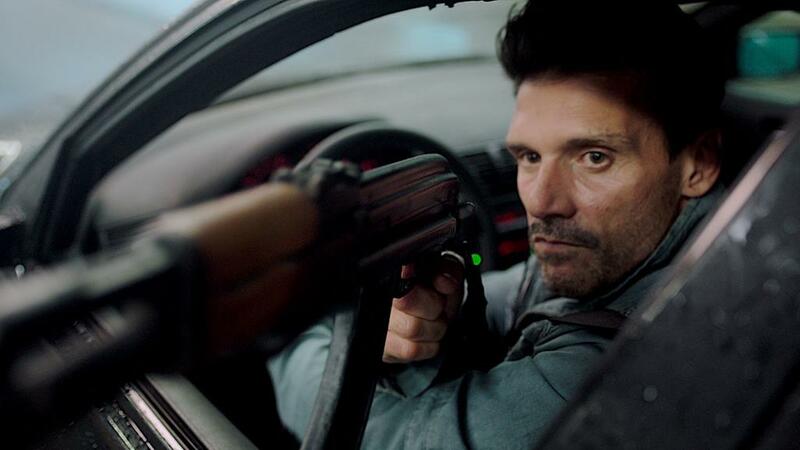 Having previously worked together on 2012's awesome wolf-packed survival film The Grey, filmmaker Joe Carnahan and actor Frank Grillo reteamed on this crime thriller, which Carnahan produced with Jeremy Rush writing and directing. This was Rush's feature directorial debut, and with it he has established himself as a director to keep an eye on in the future. Grillo plays the titular Wheelman, a guy who has taken on driving jobs for the mob while trying to build himself back up after a few years in prison. When he takes the gig of being the getaway driver for a poorly mannered bank robber played by Shea Whigham, you might think that Whigham is going to be the primary source of the troubles which are sure to come for the Wheelman over the course of the film. That's not the case, though. The antagonist here is a voice on the phone, someone calling from an "Out of Area" number who forces the Wheelman to drive off with the stolen money. Unfortunately, a mob boss was involved with that bank robbery, and now the Wheelman finds himself stuck in the middle of an attempted criminal empire takeover... and if he doesn't comply with the demands of the "Out of Area" caller, his ex-wife and his 13-year-old daughter may be put in danger. What impressed me about Wheelman is the fact that almost the entire film takes place in one car, and while we're in that car Rush doesn't allow his camera to leave that car. He manages to shoot from all sorts of angles, but the camera is always anchored to the car in some way. Even when action sequences break out, Rush doesn't give into temptation to let his camera leave the Wheelman's vehicle. Eventually, we do leave that car for a brief time, but there is more vehicular action to come. There may be a bit too much of the Wheelman talking on the phone while alone in the car for some viewers, but Grillo is one of my favorite actors working today, so I never grew tired of watching the character trying to navigate through this tough situation. There isn't a whole lot to this movie in the end, it wraps everything up in just 82 minutes, but I was captivated for those 82 minutes. Piranha 3D's Adam Scott stars Gary Bloom, who has just gotten married to a woman named Samantha (Evangeline Lilly of LOST, Real Steel, and Ant-Man) but doesn't seem to have spent very much time around her young son Lucas (Owen Atlas). 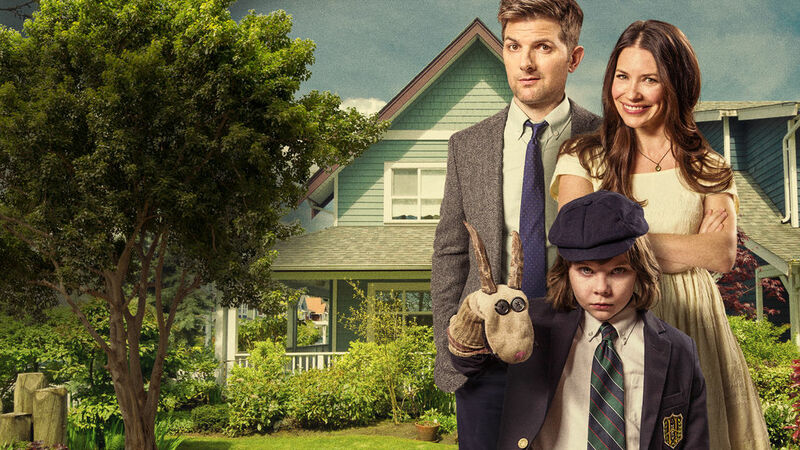 The more time Gary does spend with Lucas, the more he begins to suspect that this quiet little tyke might not just be your run-of-the-mill troubled kid, but might actually be the Antichrist. That tornado that destroyed Gary and Samantha's wedding ceremony but didn't seem to faze Lucas much might have been a sign from the beyond. It doesn't ease Gary's suspicious mind when Samantha shares the fact that her son was conceived in a very strange way. Nor does the footage the videographer (Tyler Labine) caught at the wedding of the priest speaking vows in reverse. Much like Gregory Peck in The Omen, Gary is soon convinced that he needs to kill the child to save the world... But given that this isn't a serious or a particularly mean-spirited film, you probably won't be surprised if it doesn't end with a grown man plunging a knife into a little kid's heart. Gary finds another way to save the world, and in his endeavor to do so he enlists the help of some other overwhelmed stepdads, played by Donald Faison, Chris D'Elia, Kyle Bornheimer, and the standout of the bunch, Bridget Everett. Little Evil is a pretty amusing movie. 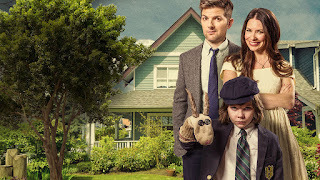 I liked the cast (which also includes Craig's mother Sally Field in a small role) and really enjoyed seeing all the little twists it put on familiar scenarios from horror classics. I'm not likely to have many repeat viewings of it, but it was a good way to spend some time for at least one watch. I'd recommend putting it on if you're a fan of the aforementioned horror films and are up for seeing a comedic variation on some of their concepts.